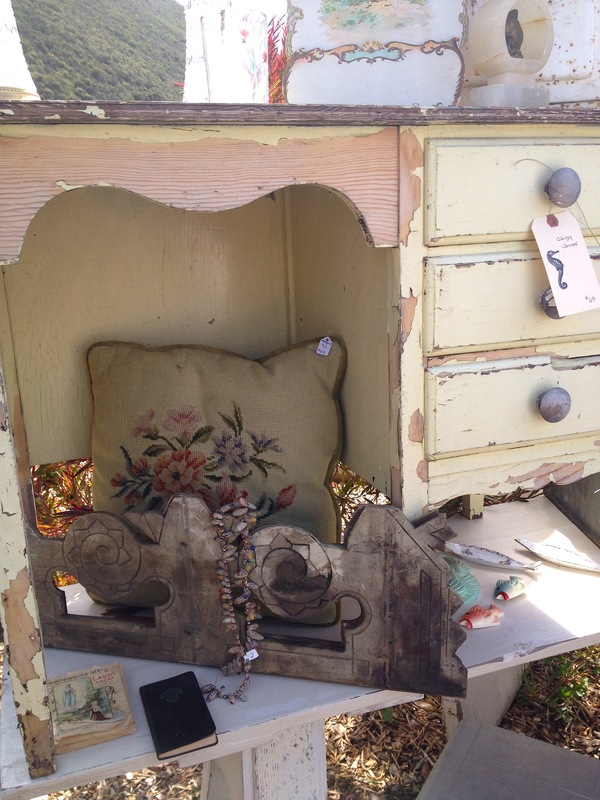 “Beachy” was the theme for Camp Vintage’s second antique show held in the rolling hills of Carmel Valley at Earthbound Farm Stand. The venue set the stage with it’s fields of produce and floral gardens. Last fall I attended this outdoor show and loved it so much, that this time I was not a shopper but a vendor. Let me describe a “vendor” to you. A vendor spends months shopping for a particular show. The day before, hours are spent packing up a truck, and in my case, a 14’ Uhaul with hired help. Once at the show location, while fighting for best position to unload close to your designated spaces, the unloading begins. This is where you must have some idea of the look you are going after so heavy pieces are not handled twice. I like to start with everything placed outside of my area, then positioning the display tables first followed by the foreground items, so I get a feel of the way I want the spaces to appear from the aisles. I then set the backdrop area and work forward, placing all the small items last. This time period of setup is about 2-3 hours, which goes by quickly. Be prepared to have plenty of change, a salesbook, pens, a calculator, tape, sold tags, blank paper to make custom signage, a magnifying loop, a toolbox of hardware, and bottles of water. While cash is the desired way to be paid, I also have an app for my iphone to accept credit cards. Everyone underestimates how much cash to bring to an antique show, so instead of losing a sale, accepting credit cards is a convenient alternative for your shoppers as they will sometimes spend more with you, as they are able to save their cash for other booths that do not accept credit cards. Camp Vintage allows vendors to set up the night before from 4-7pm, as they have overnight security. But it’s always a good idea to cover your tables of small items with a sheet or blanket for security and to deter moisture, then wait until show time to put out paper items. The next morning I am there at 6:30am. I desperately need coffee, but now the arduous task of pricing everything starts and continues even after the show opens at 8am. Our wonderful hosts, Melissa & Andrea bring each vendor coffee and muffins, which saves the day, as people are there before the opening time of 8am where the shopping frenzy begins. I am swamped with shoppers immediately. 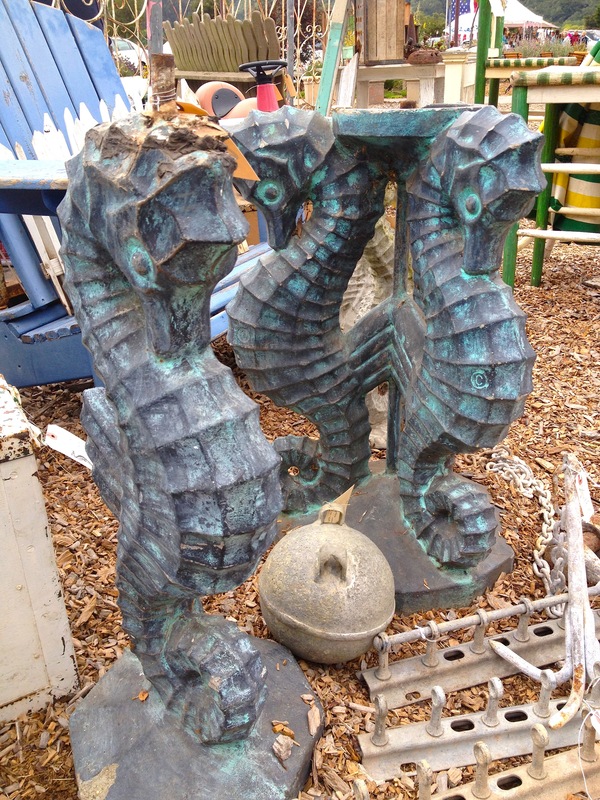 The first items to go were these darling concrete seahorse fountain spitters. They were matching in size and covered with traces of old moss. I miss them already. 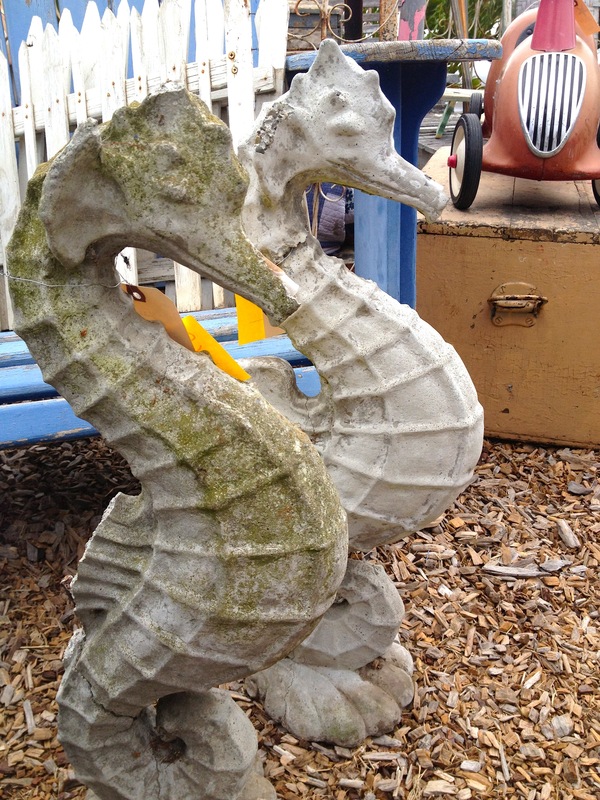 The focal point of my space was a coastal scene of old maritime anchors, nautical chain, seahorse fountains, a coastal tablecloth, a fabulous blue adirondack chair, a cool surfboard, and tons of old rusty stuff that looked like they were buried in a chest for a century. I recognize these two antiques dealers whom I sometimes run into at estate sales and auctions, and they start a pile of my best items. Two wooden standing ballusters that could frame an entry into a room, darling vintage children’s chairs, a 1950’s cardboard clown, and a huge old figural painted cow board. They have a good eye for spotting the best items in a space and leave with some of my favorite pieces. As I look around a shopper is waiting with cash in hand to pay for three wooden bar chairs that are crackled and hand-painted with florals. I almost hated to part with those wonderful chairs, but they were gone in a flash. The pace was exciting, as another dealer from Carmel Village purchased a chippy pale yellow desk, a round painted white table and an aqua painted side table. I had piles of purchased items with sold tags on them, holding them until my customers returned after scooting around the entire show. Within the first three hours, gone were my 1950’s beverage cooler, an old boat chain, tons of rusty hardware, old quilts, fabrics, small books, a wooden plant stand, a concrete chunk embedded with abalone shells, a rare child’s car, a seahorse decanter bottle, and all my furniture except 2 pieces. 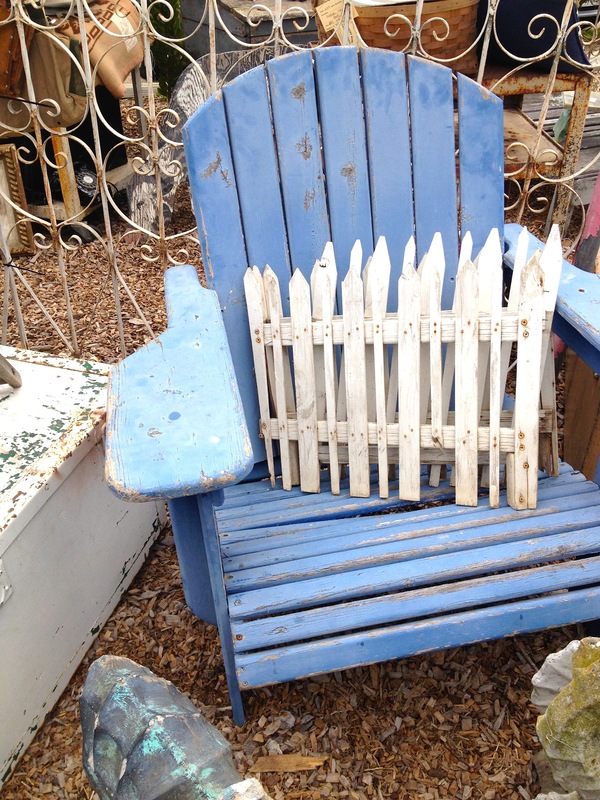 One of my favorites, a blue Adirondack chair went to a super nice gal who lives in the area. 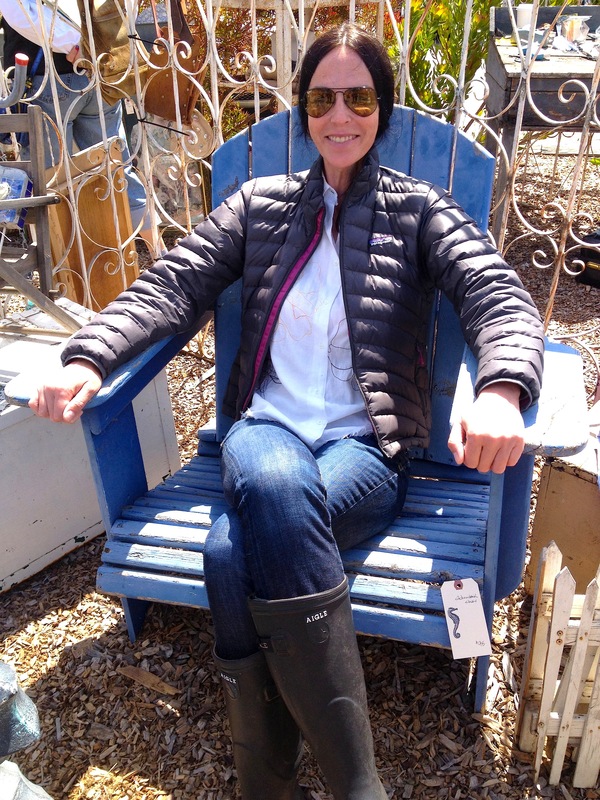 She was very tall and this particular chair was large and wide, which fit her stature perfectly. It was meant for her. Things slowed down by 1pm. Earthbound Farm Stand was just a few steps away from my space, so I scooted in for a cup of coffee and a sandwich, sat in the shade and enjoyed this break in the day. 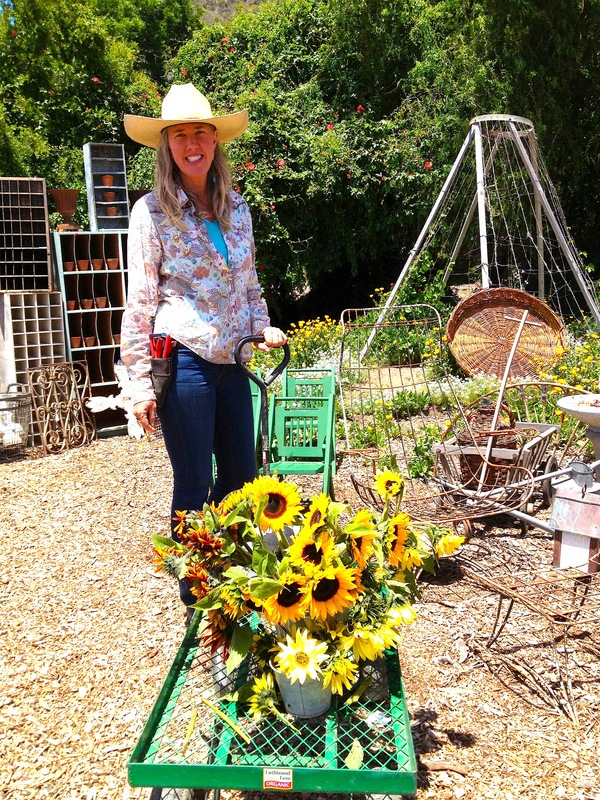 At this time, the Earthbound Farm gal, decked out in western gear and a big white cowboy hat, was pulling a green cart filled with freshly cut sunflowers to give to each vendor to decorate their booths with. Charming touch to the show. This time I cannot show or discuss what purchases I made, as I was buried in setting up and pricing my two spaces. But I will give advice to anyone thinking about selling their goods at an outdoor antique show. My advice is to have on hand lots of energy drinks, a comfortable chair, a hat, snacks, everything priced ahead of time, and a pop-up tent for shade. No matter where your show is at, shade is key. I didn’t have tents for this show, and luckily it was a wonderful cool day. But it was verging on uncomfortable without a canopy of some sort. Camp Vintage is positioned perfectly. Surrounded by organic fields, lots of parking, and conveniently close by is the Earthbound Stand available for coffee, organic muffins, salads and munchies and bathrooms. This show is just the right size with about 40 dealers and the promotors, Melissa and Andrea are just wonderful. I am hoping to be a vendor in their next outdoor faire, which is scheduled for Summer 2015. And although I so miss shopping at this show, this is one worth changing hats for, and having your pieces for sale. Already starting to buy cool coastal stuff and have checked out the prices of pop-up tents.